Mark and cut a 4 ½ inch wide and full length piece from the center of the 9 inch foam plate using the cereal box rectangle for marking. Glue the 2 edge pieces together and mark the axle positions by laying cardboard rectangle on the bottom. Mark the edges of the foam so the two axles are parallel and the car rolls straight. Glue a 4 ½ inch piece of the larger straws on the front and rear marks. Insert a 5 inch piece of the small straw thru the large straw for the rotating axles. Draw the 4 two inch diameter wheels on the remaining foam plate with a compass. Cut the wheels out very carefully and push a pencil thru the center. Mount and glue the wheels on the 5 inch straw ends so they roll without wobble. Cut and fit two 2 x2 inch piece of plate for the straw mount. Glue in place above the rear axle and seperated by a straw width as shown in the photo. Find the center of the pop cycle stick and grip it with a pliers and bend each side opposite to the other and to about a 45 degree angle. Drive a pin thru the center of the stick and bend the end of the pin 90 degrees push against the stick and glue in place. Bend the other end of the pin into a small loop to hold the rubber band. Find or tie together thin rubber bands to make a length 1 inch shorter than the very large straw. Squeeze the loop in the pin onto the band and pull the other end thru the straw with a string. Use a piece of straw glued to the big straw to hold the end of the band. 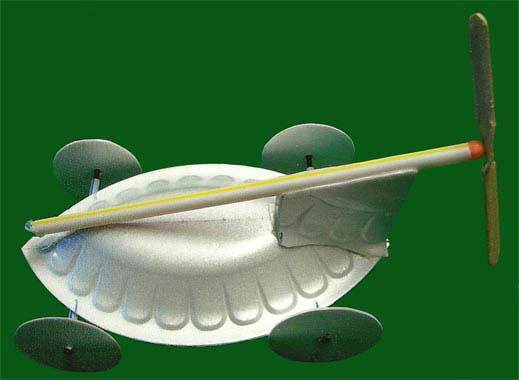 Wind 50 to 100 turns so the propeller blows air back and release on a smooth surface. For better performance sand the leading edge round and trailing edge sharp and add a drop of oil to the bead and sand bumps from the wheels. Have fun and keep experimenting.